She wasn't particularly spiritual. She was looking for something else. A series of failed relationships behind her, she kept hoping for a real connection. Something that would last forever. Something that would satisfy that desire within her. And then she met Jesus. Her trip to get water from the well turns into a discussion about living water - and a relationship with the living God. A relationship better than all her previous relationships, that will endure, and give her the satisfaction she has been seeking. 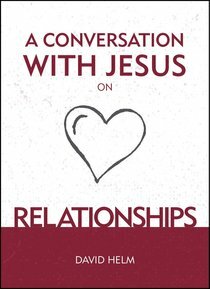 About "A Conversation With Jesus... on Relationships"
As a church-planting pastor and father of five, David Helm is Senior Pastor of Holy Trinity Church, a multi-site church plant in Chicago.